I’m a big advocate of cloth diapering; there are a lot of great benefits to doing so. However, there are a lot of common mistakes new parents as rookie cloth diaper users. Cloth diapering should be a really simple process, but the internet has seemingly made things a lot more complicated than it should be. There is, as much as I hate to admit, a lot of bad advice out there that’s making things a lot harder than necessary. It’s really easy to avoid making these errors if you know about them. I hope to clear up some misconceptions a lot of parents have about cloth diapers! 1. Not changing the diaper often enough. You might be surprised, but this is a really common mistake parents make. If you’re going to use cloth diapers, you really have to be changing them as soon as your baby wets. Not doing so is inevitably going to end up in leaks and rashes. Make sure you always carry extra diapers with you when you’re out, and if your baby wets, find your way to a changing table as soon as possible. 2. Not having enough diapers in their stash. You really need to have at least 24 diapers as a minimum to make sure that you always have enough on hand to keep your baby in a dry one at all times. I’d personally recommend 36. The average newborn will go through about 8-10 diapers per day, so this will give you enough breathing room to make it a day or two without running out, if necessary. 3. Not washing the diapers properly. There is a right way and a wrong way to wash diapers, and a lot of parents do it the wrong way. The most important thing to remember is to not use any washing agents that will damage the diapers or harm your baby. You can use bleach, but make sure it’s diluted — not straight bleach, which will eat away at the materials of the diaper. Also, don’t use fabric softener: it’s not necessary and causes rashes. 4. Not washing the diapers daily. If you’re going to use cloth diapers, be prepared to wash them daily. It’s sometimes easy to get lazy and leave them for a day, but this is an awful idea. 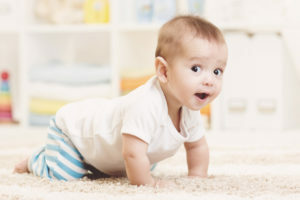 Diapers that sit for a while start to stink, stains will set in, and mold and bacteria will grow. Not only that, but you’ll be more likely to run out of clean diapers. 5. Not drying the diapers properly. Air drying is the best way to dry cloth diapers. If you can hang them outside, this is ideal, but you can also use a laundry rack inside the house. If you have to use the dryer, make sure not to leave them in too long. Take them out of the dryer once in a while to see if they’re dry. 6. Buying diapers made of cheaper, synthetic materials. Don’t cheap out on your diapers: go for those made of natural cotton. Diapers use either synthetic or natural materials for the inner absorbent part, and you should always go for those that use natural materials. Synthetic materials can cause both immediate and long-term problems. Generally, synthetic diapers are made out of polyester. A quick rule of hand is this: if a diaper isn’t made of cotton, hemp or wool, it’s using a synthetic material. 7. Not buying the proper size of diapers. You might think it’s a good idea to buy diapers that are slightly bigger than your baby needs so that they’ll grow into them, but it’s just not a good idea. They’re not going to fit properly, meaning you’ll have to use bigger covers to fit over the huge diapers. Your poor baby is going to have so much extra material on their bottom because of this! Not to mention that oversized diapers open up the possibility of leaks. It’s just not worth it. 8. Overusing diaper cream or using the wrong kind. Diaper cream is great, but thick white cream is not ideal for diapers. It’s hard to wash off of cloth material. Another big mistake is overusing diaper cream: you don’t have to use it for every changing. Damp skin will look red; this doesn’t mean it’s a rash. Overusing diaper cream just builds up in the diapers, reducing absorbency. If you need to use creams regularly, use flushable diaper liners to protect the fabric. 9. Not dumping the poop and rinsing the diapers right away. When you change diapers, make sure to dump the poop in the toilet right away and rinse them well. 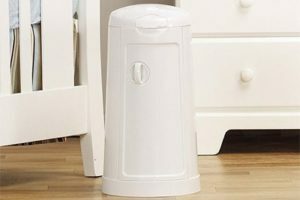 If you don’t use diaper liners, spray or dunk them in water before throwing them in the diaper pail or washing machine. Not only is leaving poopy diapers around gross, but it will contaminate the washing machine for the rest of your clothes. Don’t do it. 10. Not being prepared to deal with soiled diapers outside the house. Poop is going to happen, and it’s not nice to have a soiled diaper with you and nowhere to put it. A quick solution is to throw it in a ziploc bag, but that’s not going to contain the smells, and believe me, there are going to be some. A good wet diaper bag will help contain the smells until you get home. Did you make any dumb mistakes when you started cloth diapering? Let us know in the comments below! Thanks for stopping by! I love your site, it looks like a great resource for cloth diaperers. Yes, cloth diapering isn’t the easiest, and that should have been mistake 11: not trying different styles of diapers when things aren’t working as well as they should be. Any recommendations on best diaper rash creams?